I recently painted my kitchen. We changed from a light spring green, to a beautiful aqua color called "Hawaiian Sky". I absolutely LOVE it. It's so peaceful and calming. 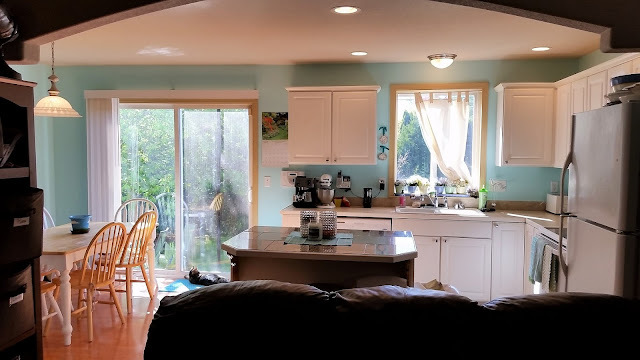 Of course, as home improvement chain reactions go, I am now on the lookout for a few teal accent pieces to help tie the colors in the kitchen together and give some pop to the room. Most everything in the kitchen is white (cupboards, appliances), including my Kitchenaid Mixer. I thought, hey, maybe I can gussy this thing up! 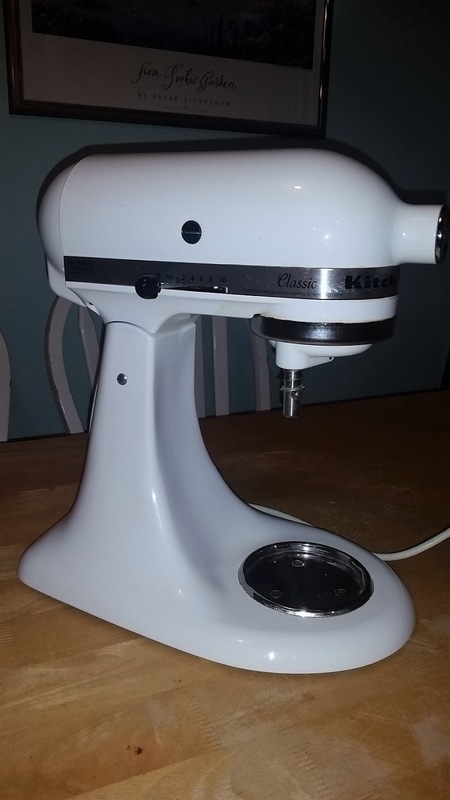 Plain, white, kitchenaid mixer. 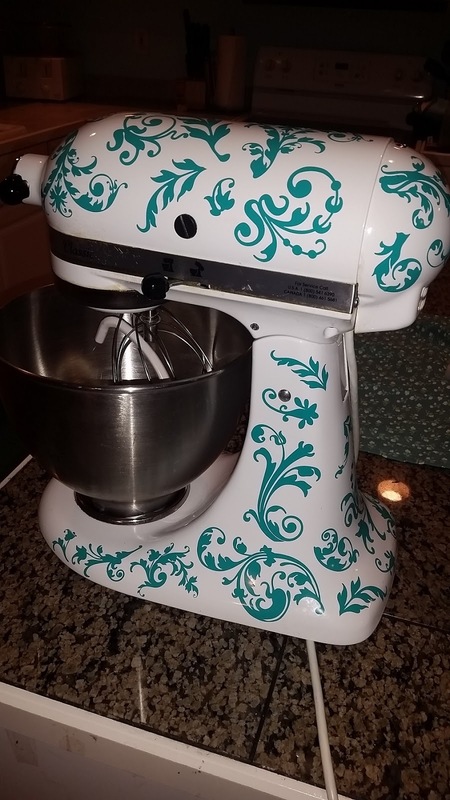 I'll now call this "the before"
I have long admired some of the Food Network gals and their fancy hand-painted mixers, but the lofty price tag kept me at bay. I went over to Etsy just to see what was available, and found some gals that make vinyl decals specifically for your Kitchenaid... and I decided I would TRY IT! 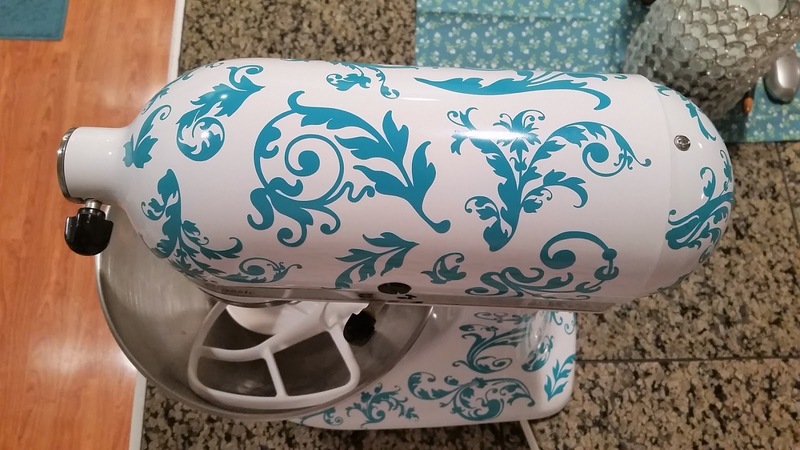 There were many styles to choose from, but since I like swirly, and filigree designs, I went for a shop called "Good Golly Graphics" because they could do the cool design I really liked, in the exact turquoise color that would go with my kitchen. Fast forward a few days later, and I was so excited to get this little package in the mail. It contained tons of decals, a page of detailed instructions on how to do this project, and bonus - some links to some YouTube videos for the visual learners like me. I decided to lay the designs all out to see what I had: The nerdy symmetrical side of me was immediately giddy to see that each design had a matching set on another page, only the opposite direction, which would end up giving you more variety in the long run on which way you wanted the design to go. There were a ton of decals in the pack. Very nice! 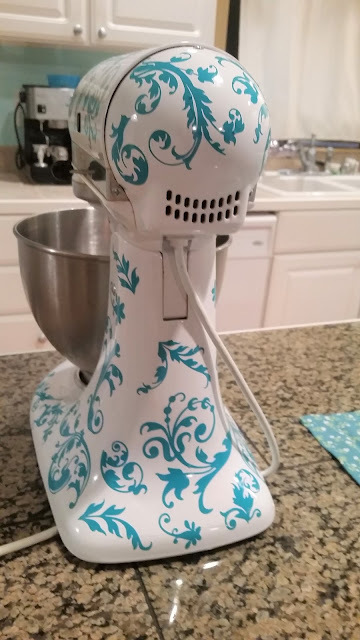 The first step was to clean your kitchenaid mixer. Let's just say it had been a while. Who knew flour could get way back there?? I got out my trusty degreaser spray and scrubbed that baby until she shone like the top of the of the Chrysler building (random Annie reference for your amusement). 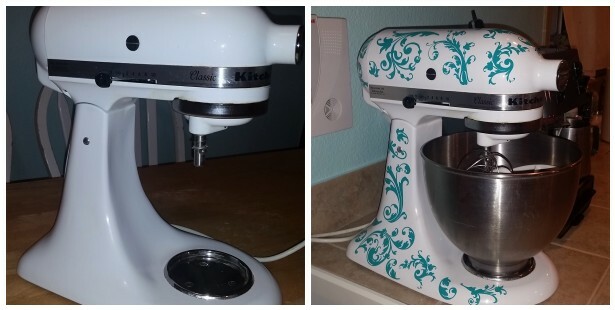 After you have a clean, smooth surface, you can begin to place the decals on the mixer. Being a perfectionist, and nervous, I watch the link to the YouTube instructional a few times to get the gist of things. I waited til the kids went to bed (no interruptions) , and then I excitedly started my project with the perfect amount of peace and quiet to think about my masterpiece! 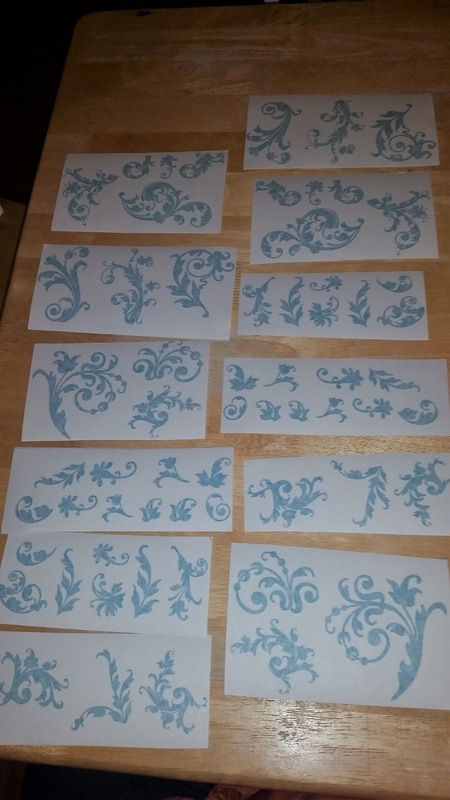 The first step is to cut out the designs, very close to the decal. The trick with the kitchenaid, is that it is curvy in spots. Okay, all spots. Let's just say I don't think there is a truly flat, flat spot on the whole thing. 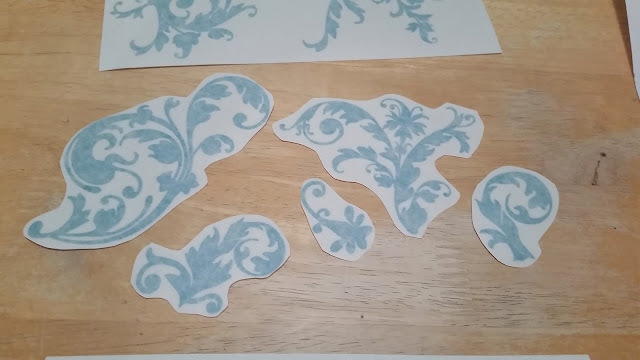 Not only should you cut the designs out close to the vinyl, but if there are any leaves or swirls that go into the design itself, to clip down between the shapes (white sections of the design) and make some snips so that your design would be able to bend around curves. The next step is to get some blue painter's tape (hey, I JUST happened to have that, I just painted my kitchen, how did you KNOW!?) and tape your selected shape at the top and press firmly a few times, making a flap of sorts. 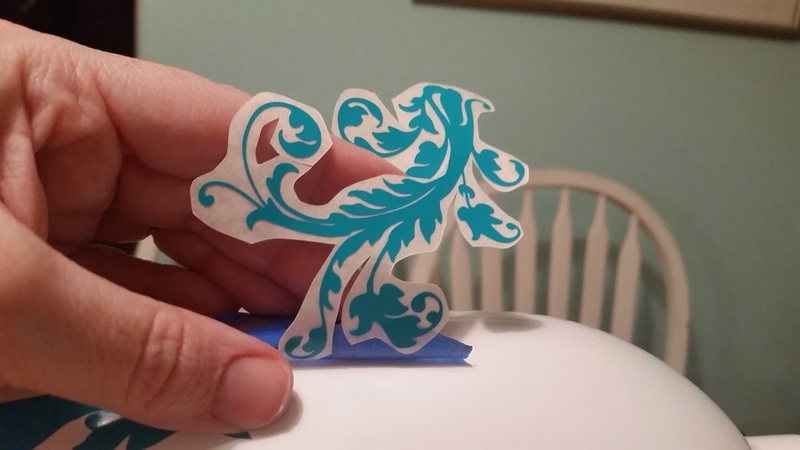 My first decal. I was so nervous and wanted to get it right the FIRST time. So now that the tape is at the top, it will act like a "hinge". Flip up the design and take off the stiff backing while basically holding it upside down. The vinyl will stay on the bendable top layer. 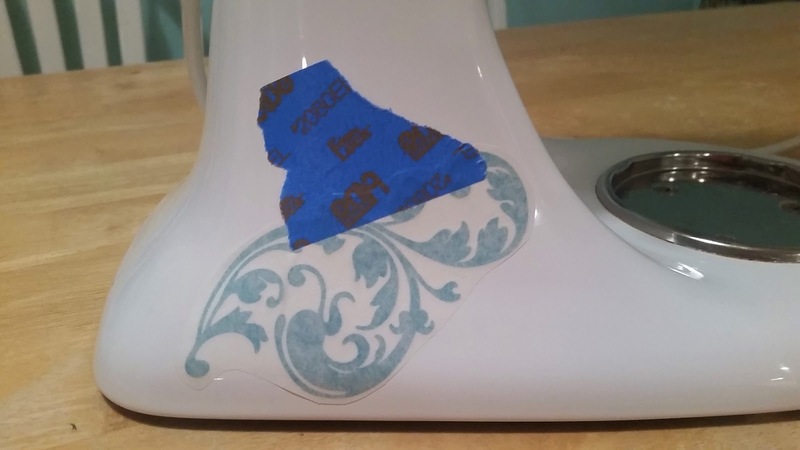 Once the backing is totally off, the painter tape has kept your design exactly where you want it without shifting. Then you slowly roll the vinyl shape down over the mixer's curved surface, smoothing as you go down (no picture of this, I need both hands on the decal). Once in place, rub gently over the whole shape to help seal it to the mixer. Then take the blue tape off (it comes right off, I used the same piece again and again). 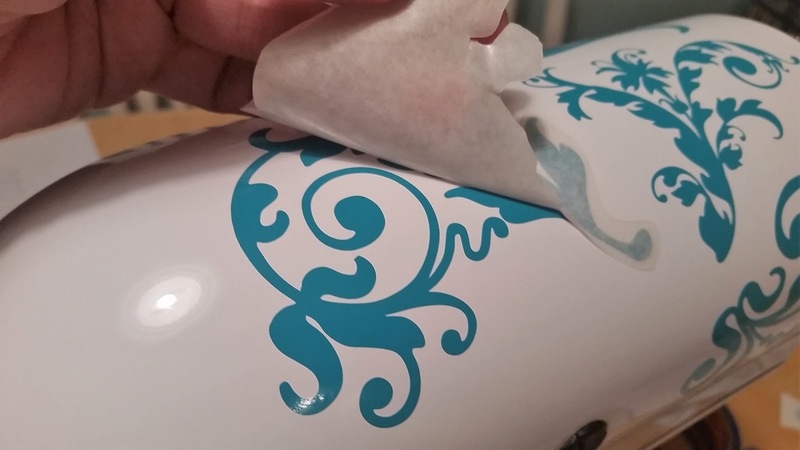 Now you can pull off the top backing layer of the vinyl decal. The trick is to pull steadily at a 45º angle with even pressure. Four pieces down - no turning back now! I felt it was logical to do some of the largest pieces first, to make sure they would fit, especially up the sides and over the top, then I would go back and fill in with some of the smaller swirls. I'm not gonna lie, I was a little stressed at making sure the design wasn't going to be too busy, that it had enough visual white space, and that the pieces looked like they went together. Taking your time and planning ahead are key. Luckily, the decals are kind of see through, so you could lay them out and see how they would fit with the one next to it. The hardest part I think was the back rounded end of the mixer at the top. It was the most curvy and the trickiest to make sure the vinyl went down flat. Holy cow, it's turning out so cute!!! I decided to put the Kitchenaid back on the counter, with the silver bowl back in place for the full effect. You can see that I decided to leave the center part where the bowl sits white (I thought that gave it a nice contrast) and I can't believe how NICE it looks with my new aqua walls! My hubby came home and was actually impressed. He said it gave it "personality". A designer look at a bargain price! 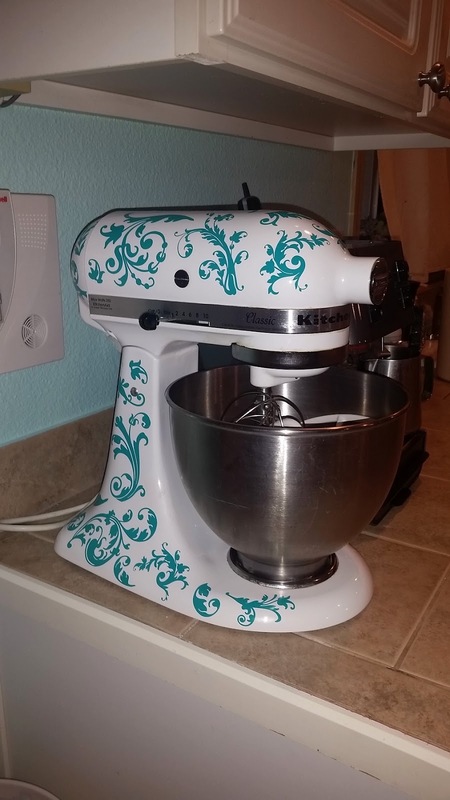 So if you have an older mixer (before all the snazzy colors came out), or even if you have one of those newfangled colors, you can get some awesome decals for under $20 and try out a cool design that matches your kitchen. 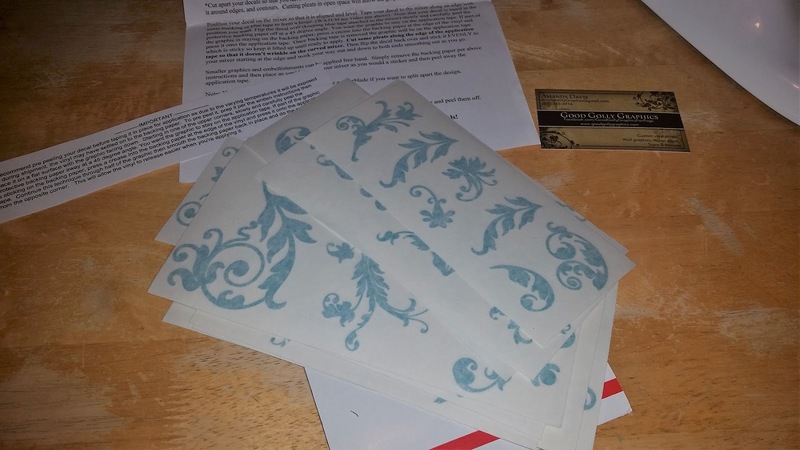 Check out Good Golly Graphics because, not only can she customize the shown design into a ton of specialized colors (even silver and white), I found out she's an Army wife and doing this as home business while her hubby is deployed and she's keeping down the fort at home, so it's a great way to support the troops too. 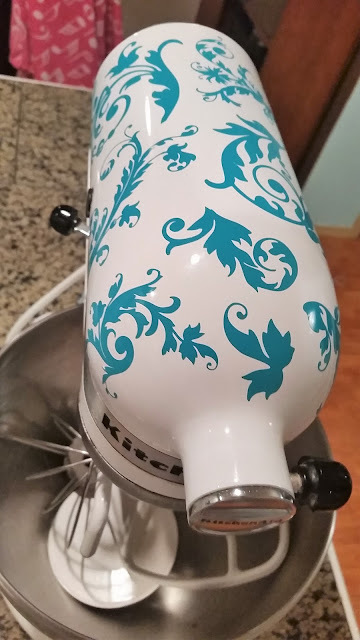 By the way, the exact design I picked is called "Flourish kitchen mixer swirl decal" and you can find it by clicking here. She had a ton of colors to choose from. I just love how it went from plain Jane to designer awesome in one evening. The best part is, if I ever change my mind, the vinyl is removable and I can go back to plain white, or change it up with a new masterpiece if I wish. Plus, you don't have to go girly or swirly. I saw designs on Etsy for every taste. 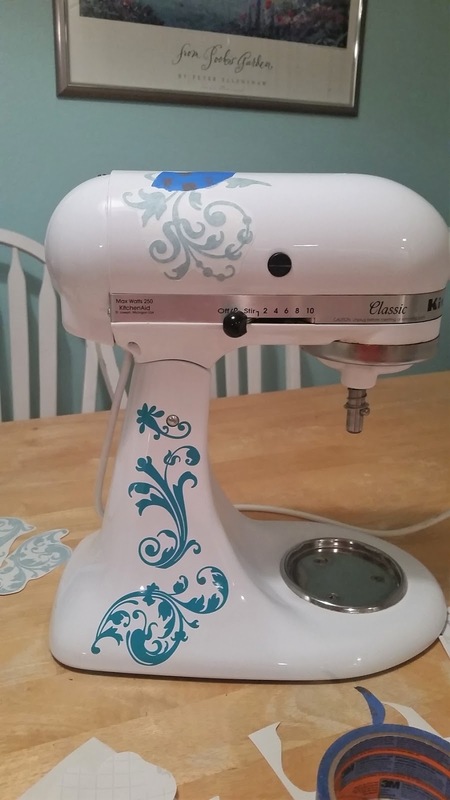 There were flame decals, nerd decals like turning your kitchenaid into a tribute to R2D2 or the TARDUS, fruits, tropical flowers, cherry blossoms, polka dots, Disney fun, animal prints - really you are only limited by imagination. Now get out there and gussy up your Kitchenaid mixer, stat! 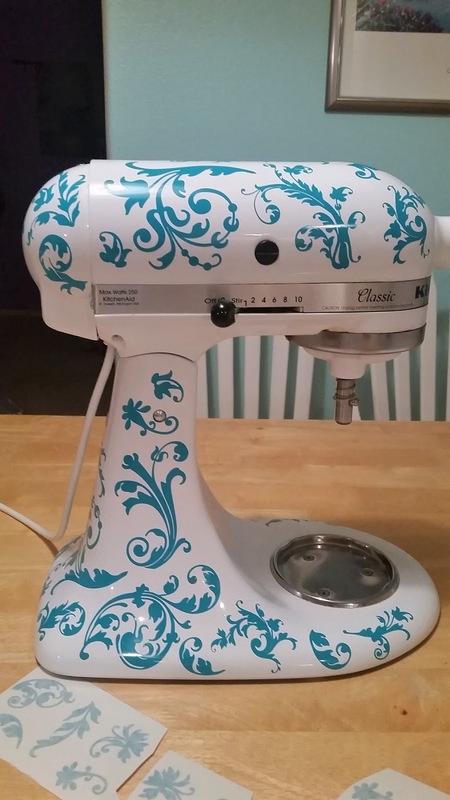 You did a lovely make-over on your mixer! I have a black one, and was looking for ideas to jazz mine up a bit. Thanks for posting this.